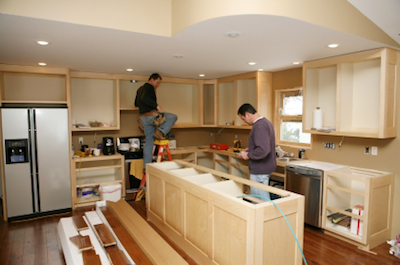 For most homeowners, a kitchen remodel is something they dream about for months – years – until finally, they take the plunge. Remodeling your kitchen allows you to make it the way you want it to be. Select the wood for your cabinets. And don’t forget about the kitchen floor. Before you make your final selection, ask yourself three questions. What will you have to do to maintain your kitchen floor selection? How well does this type of flooring handle under spills and moisture? What styles are available to look great in your final design? Durability is the name of the game. The more action in your household, the more you’ll want to select a floor that can handle the pressure. Three of the best choices are tile, hardwood, and resilient. Tile is one of the long-time favorites for kitchen flooring choices. They are practical yet beautiful at the same time. Of course, you can go with more traditional ceramic or porcelain. But with today’s technology, you might be surprised at the wide range of styles, colors, sizes, and patterns available. How about choosing a tile floor that looks like granite? Or how about selecting tile planks that mimic hardwood? This will allow you to spend more time enjoying your kitchen, and less time cleaning it. Hardwood gives you a timeless look that you’ll love for years to come. If you have hardwood throughout your living space, why not continue the look into your kitchen as well. While they do need a little bit more maintenance than tile, with regular cleaning they will continue looking great for years to come. Are you looking for the looks of hardwood, without the upkeep or maintenance required to keep them looking great for years? Look no further than resilient flooring. Resilient flooring is also called luxury vinyl. It’s versatile, affordable, and will last a long time if properly maintained. This isn’t your mother’s vinyl. Instead, it’s made from waterproof composite material designed to give you the look of hardwood and tile without the fuss or worry. It’s easy to care for, scratch resistant, stain resistant, and waterproof. Perfect for busy households with pets and kids. So what’s the right flooring choice for your home? Need some help deciding? We’re happy to help; stop by and see our full selection today.